MADERA, CALIFORNIA (July 28, 2018) – 11 year-old Tyler Reif of Las Vegas, NV won his first career 51FIFTY Energy Drink Jr. Late Model race while Bakersfield’s Buddy Shepherd nabbed $5,000 in the RPM Mortgage Pro Late Model Series during Saturday’s Summer Speedfest at Madera Speedway. 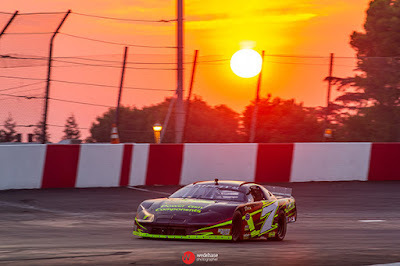 A hot night of racing challenged the drivers in the MAVTV-televised racing on the one-third mile speedway. Round #6 of the 51FIFTY Jr. Late Models was a 70 lap race. The redraw of the top-six cars placed defending champion Jesse Love of Menlo Park on the pole but he was passed on the outside by Kayla Eshleman of Fontana who led lap one. Love and Austin Edwards were among early drivers to fall out of the race with mechanical problems, with Love credited with 15th position as the last place car. A four car incident in turn one ended the debut for Bakersfield’s Zachary Ginn, who also races in the Mini Cups vs. Bandoleros series. Calvin Hegje and Tanner Reif were also gathered up. Two-time 2018 winner Dylan Zampa of Napa started a long battle with Tyler Reif for second on lap 11 and the duo rarely separated throughout much of the event. Reif cleared Zampa then saw Zampa crawl right up to his rear bumper on lap 20. A spin from Watsonville’s Lilly Mead from seventh place on lap 26 brought out the caution. Issues with the pace truck forced an extended stoppage that ended up being the lap 40 break, 14 laps early. Tyler Reif nosed inside Eshleman for the lead coming out of the break and took over the top position on lap 32. The caution flew on lap 33 and on the restart Zampa went around Eshleman for second using the outside. Eshleman fought to get the spot back on lap 37. The pair went side-by-side in lapped traffic on lap 45 which sparked a wild crash. Eshleman tagged the left rear of Hailey Liles, sending Liles down the track to hook the rear of Zampa. Zampa hit the front stretch wall head on. Liles spun back down the race track and made contact with Eshleman again at start finish. Remarkably Zampa was able to make repairs to both ends of his race car to continue on as he tried to close the points gap on Jesse Love. Hegje and Kyler Berry had an incident for another caution on lap 46. Madera’s Joey Iest charged up to third in his debut, before tangling with Eshleman in turn three for a caution on lap 47 that sent both to the rear. The incident thrust Tanner Reif back into the picture behind his brother Tyler. One additional caution late in the running set up a sprint to the finish that wowed the crowd. With both drivers chasing their first career series wins, the younger Tyler held off Tanner by a nose in a sliding duel to the checkered flag. Zampa managed third to unofficially take the points lead. Eshleman and Hegje rounded out the top-five. The Summer Speedfest 100 for the RPM Mortgage Pro Late Model Series was a battle to see who could outlast a tough night. Points leader Austin Herzog, age 15 from Clovis, drew the pole position but was overhauled by Military Tribute Night winner Racin Vernon of Bakersfield on lap one. Two-time series champion Buddy Shepherd went inside Herzog to take second as well. Shepherd reeled in Vernon by lap five and they went side-by-side. The Bakersfield drivers battled until lap nine when Shepherd took the lead. The field hit lapped traffic in the 22 car starting grid by lap 18 with the first caution not falling until lap 25. Dillon Tucker stalled on the backstretch while both Erickson and Kolby Berry spun on opposite ends of the track. The caution was ruled to be for Tucker with an electrical fire, allowing both spinning cars to get their spots back. Under caution, oil was found on the track from the rear end of Garland Tyler’s car. Both Tyler and Tucker made repairs and returned after a lengthy red flag. Tyler then spun on his own on the restart and B Main winner Ryan Hart tangled with Jack Wood coming back to the yellow. Racin Vernon fell backwards on the restart getting passed by both Jason Aguirre and Adam Lemke. He eventually fell back to eighth on lap 35 behind Matt Erickson. The battling for Vernon intensified when he went three wide with Ryan Philpott and Logan Zampa, bouncing off the backstretch wall for a lap 37 caution. Vernon managed to make repairs and continue. Eighth starting Aguirre made his way around Herzog to take second place on the restart with Shepherd leading Aguirre across the stripe to the lap 50 break. Coming out of the break for MAVTV interviews and adjustments, Herzog and Aguirre had a big sideways slide down the front stretch that bounced them back to fifth and sixth. Rookies Adam Lemke and Nick Grossi took advantage of all the sliding around within the top-five to move up to second and third behind Shepherd. Carlos Vieira started to join the battling as well moving past Grossi into third on lap 62 bringing 2016 champion Matt Erickson with him. Erickson moved past Vieira for third by lap 71 before a caution on lap 73 when Kolby Berry’s engine expired in turn four. Lemke and Herzog battled for second place on the restart before a red flag on lap 80 for the most serious crash of the evening. Rookie Christian Roche of Oakdale slid off the wall in turn four and clipped Ripon’s Henk Gaalswyk, with both making significant impact to the wall to end their evenings. Another caution came out when Zampa stopped in turn four on lap 82. Impending curfew meant the final caution would end the event and gave Herzog and Erickson one more shot at Shepherd. Shepherd pulled away when Vieira and Aguirre had a grinding crash off the front stretch wall to end the race on a lap 87 yellow checkered flag. Shepherd, Herzog, Erickson, Lemke and Dillon Tucker were the top-five at the finish. The Mini Cups vs. Bandoleros 20 lap main event was also spectacular, but not as much in the Bandolero portion of the race within a race. Bakersfield’s Riley Massey got the job done on that end with a comfortable 7.9 second win to extend her points lead. But the battle that transpired half a track behind her was one of the best of the year. Mini Cup points leader Kabe McClenny and Napa’s Aaron Thomas battled back and forth for the lead of their class throughout the entire race, doing so in the vicinity of second place Bandolero Hank Hall of Bakersfield. The trio ran three-wide on numerous occasions and darted in and out of lapped traffic. McClenny finally drove away from Thomas in the closing stages of the event to win the Mini Cup portion of the evening yet again. The overall finish saw Massey’s Bandolero followed by McClenny, Thomas, and Aiden Phillips’ Mini Cup. Hall suffered a mechanical problem on the final two laps to soldier home in seventh. The Modified Super Toyotas started with Dave Lander leading the way before a multi-car spin in turn three closed the field up. Shaun Reynolds took over the lead and did not look back ahead of 2017 champion Bert Stephens, while Lander and Patrick Geiger raced hard for third place. Lander and Geiger wrecked hard coming to the finish line with Geiger flipping across the line. He was uninjured and was credited with fourth behind Lander. Madera Racing on MAVTV airs Thursdays at 5 p.m. and 8 p.m. PST and is also available on the Lucas Oil Racing TV app.